Sound Transit is not only seriously upping their graphics game; they’re also planning to deliver the biggest expansion of transit service seen in years by the agency. 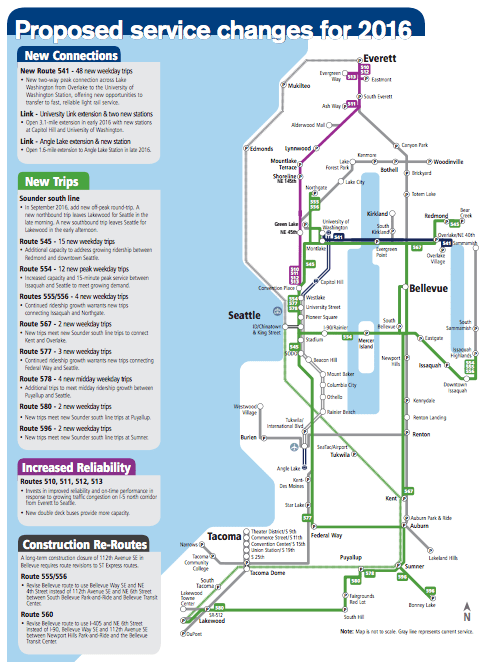 Sound Transit released their Draft 2016 Service Implementation Plan (SIP) earlier this month with promises to improve reliability on four core Express routes, open two light rail extensions, begin a new Express bus route, and add trips to the Sounder South Line and nine Express bus routes. A new route will be added between University of Washington Station and Overlake Village via Overlake Transit Center in Redmond. 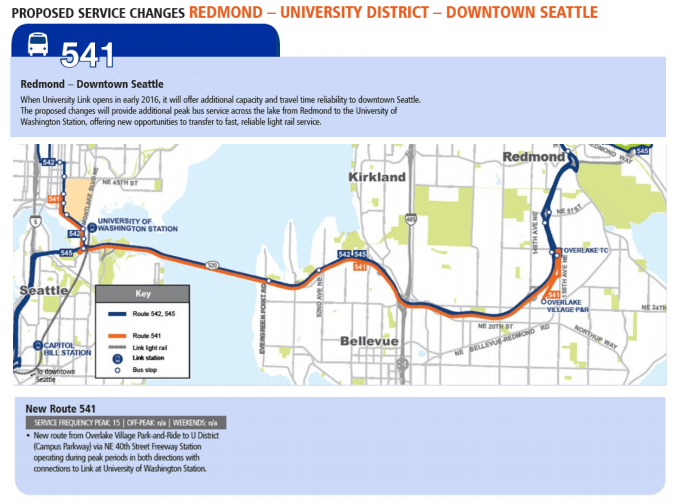 That route will be numbered as the 541 and joins its sister routes to Remdond, the 542 (Greenlake via the University District to Redmond) and 545 (Downtown Seattle to Redmond). The route will operate during the peak and is slated to receive 48 daily trips. Sound Transit had considered truncating the sister route, 545, at University of Washington instead of continuing to Downtown Seattle. However, that did not end up as part of next year’s SIP. Regardless, the 541 will offer a frequent service along the core of the SR-520 corridor and offer Sound Transit an opportunity to evaluate the effectiveness of the route. Aside from new Route 541, nine other Express bus services will see improved services. Snohomish County-Seattle buses (Routes 510, 511, 512, and 513) will receive investments in more service hours to enhance reliability. Traffic on the I-5 corridor causes many trips to become heavily delayed; following trips are often simply canceled. Sound Transit will add scheduled service by as much as 7.5% and as little as 2.3% across the four routes. And to aid with capacity issues on some routes, double decker buses will be deployed later in the year as they become available. 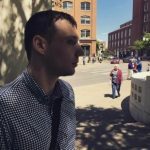 Meanwhile, 44 daily weekday trips will be made to six intra-King County routes (545, 554, 554, 556, 567, and 577), one Pierce County-Seattle route (578), and two intra-Pierce County routes (580 and 596). A major share of these will go to SR-520 corridor service. 19 trips will go to Route 545, 555, and 556. Another 12 trips will go to Route 554, an I-90 corridor route. Together, all of these Sound Transit Express service improvements totals 32,000 new service hours and 90 new trips. Central Link Light Rail will see two extensions realized in the coming year. The first will open in early 2016 by extending service from Downtown Seattle to the University of Washington. That 3.1-mile tunnel extension has been in construction since 2009. New stations will open in Capitol Hill and Husky Stadium. The second extension is planned for late 2016, which will bring service further south to Angle Lake (2o0th St S). That 1.6-mile extension is entirely elevated and will add one station beyond SeaTac/Airport Station. When both extensions are fully operational, travel time between the terminuses is anticipated to take 51 minutes. Meanwhile, the length of the alignment is 18.8 miles, meaning an average speed of trains will be 22 miles per hour. Frequencies are planned to be every 6 minutes during weekday peak hours, every 10 minutes during midday and evenings, and every 12 to 15 minutes at all other hours. This isn’t exactly a change. Sound Transit increased the frequencies to match this service pattern in September, which was ahead of schedule for the agency. At the station level, travel from the new University of Washington Station to Westlake Station will be 8 minutes. Capitol Hill Station is smack dab in the middle of those two, meaning 4 minutes to either station. And both of these new stations promise to greatly improve local mobility for those with direct access. A comparable bus ride1 from Husky Stadium to Downtown would take at least 22 minutes while Capitol Hill to Downtown would take at least 10 minutes. At peak times, the time savings are even greater. For Angle Lake to SeaTac/Airport Station, the travel time is expected to be 3 minutes. Trip times on the bus are at least twice that. RapidRide A runs along the same corridor and typically takes about 6 minutes. Again, Link will offer many locals a quicker bus ride. It’s been a few years2 since Sounder has gotten love. But next September, Sound Transit will pour on its first off-peak roundtrip for the South Line. A late morning trip will operate from Lakewood to Seattle and its companion return trip will depart Seattle for Lakewood in the early afternoon. Two more roundtrips will be added in late 2017 as well. Before any of these changes are adopted, Sound Transit will hold an open house followed by a public hearing next week. You can attend both Thursday morning (November 5th) in Ruth Fischer Boardroom at Union Station (Seattle). The open house runs from 9am to 10am with the public hearing beginning promptly at 10am. Alternatively, you can e-mail your feedback on the SIP to the Board of Directors. September 2013 was when the last trip was added. In terms of RR A line, it took 15 minutes due to construction from TIBS to Angle Lake. Yet the Mayor of Des Moines thinks SR 99 would turn Pacific Highway South into what the monorail has done to 5th Avenue. He thinks that no one would redevelop along the corridor with a 35-40 foot elevated structure. One of my Sound Transit insiders told me they will continue to operate 2-car trains on Link, in spite of the huge leap in ridership expected, especially on the ULink extension. Anybody have any later intelligence on this? One ST representative at Gridlocked for Seattle LiveWire said they would intermix 2 and 3 car trains. Well, that would be a start. They have just enough fleet (62 cars) to operate 6-minute headways with 3-car trains, and still have close to 10% spares.